Made with 100% Natural and organic ingredients, this product improves water quality, fish and plant health. Barley Straw Pellets are the most convenient form of barley today. They should be introduced preferably where water is flowing and the depth is less than three feet. You may also place some in your filter media box. You may start your application any time of the year. Enriched with peat and humic acid, this revolutionary formula works faster & better with Less Mess & Cost and is easier to apply than bales, pillows and pads! 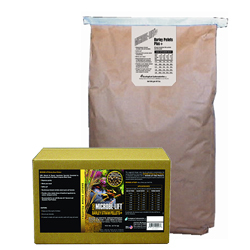 Microbe-Lift Barley Straw Pellets is an environmentally responsible, cost-efficient pond conditioner that is a natural and organic way to a healthy pond environment! Barley straw and selected natural peats have been processed and packaged to make them easy and clean to apply. Manufactured using an exclusive proprietary pelleting process that eliminates the use of wheat, corn and other binders, the barley straw is harvested and stored under climatic conditions that assure the quality of these essential ingredients. Microbe-Lift Barley Straw Pellets works in much the same way as barley straw...only faster! Whereas barley straw works by releasing certain natural chemicals as it biodegrades, so do the pellets in Barley Straw Pellets, only the breakdown compounds are released faster: dispersing equally throughout the water; reacting photo chemically with sunlight; and activating humic acids to produce hydrogen peroxide - an oxidizing agent that also helps to keep the water clear - naturally and at a low level of release. The humic acid will also chelate metals such as copper or arsenic. Microbe-Lift Barley Straw Pellets are rich in organic peat which softens pond water-reducing nitrate and phosphate concentrations in the water column-and provides a buffering agent and ion attenuation in lined ponds that additionally gives them some beneficial properties of earthen ponds! Please note: Microbe-Lift Barley Straw Pellets will leave a residue on the bottom of the pond. The bacteria in the Microbe-Lift products as well as Microbe-Lift Sludge Away will digest this organic residual.